We have taken delivery of the all-new Kia Stinger in Odessa, Texas. This high-performance five passenger sportback model is the first of its kind with sleek and muscular body styling, leather appointed interior and satin chrome interior trim. It is offered with a choice of two turbocharged engines; a four-cylinder 2.0-liter Theta II engine that delivers 255 hp or a 3.3-liter twin-turbo V6 Lambda engine with a remarkable 365 hp output. 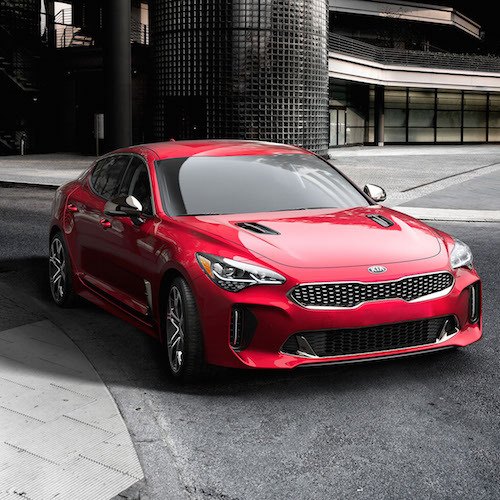 The new Kia Stinger chassis is comprised of 55 percent advanced high-strength steel and is the first model to utilize Kia’s electronically adjustable suspension, Dynamic Stability Damping Control. The Stinger’s sports influenced front and rear suspension deliver a new level of driving dynamics while providing optimal feedback to the driver. The new Kia Stinger is now available for sale or lease in Odessa. Factory incentives and dealer special offers may apply. Please contact us if you would like to learn more about this exciting new Kia or if you would like to schedule a test drive of the new Kia Stinger in Odessa, TX. Copyright © 2019 Kelly Grimsley Kia. All rights reserved.